Hello, old friend. Happy New Year! I paddled my first Florida river in July 2010 and have paddled over forty Florida rivers since. Unquestionably, Fisheating Creek holds a place in my top five. I love this waterway! As I have done in the past (because I have yet to buy my own kayak, and I need a drop anyway), I rented a kayak from the Fisheating Creek Outpost in Palmdale. (The people are great; the kayaks, a bit worn.) They dropped me, along with five others, around 10:00 a.m. at the Burnt Bridge put-in, giving us an eight-mile paddle back to the outpost—about four hours. I waited to put in last, standing on the shore and taking it all in. Fish jumped as if playing a tune on a xylophone, and then, seemingly on cue, an alligator glided slowly along the top of the water in the distance. It all appeared to be an opening number of a musical, a glimpse of something wonderful yet to come. This would be my third paddle on Fisheating Creek. I paddled it in October 2011 and July 2014—both times with a much higher water level. The level on New Year’s Day was just over three feet. To paddle without portaging requires a minimum of one and a half feet. I would not want to portage on this creek with as many gators as I saw this day. I paddled away from the shore, feeling somewhat secure that I had remembered to bring my snake knife this time! 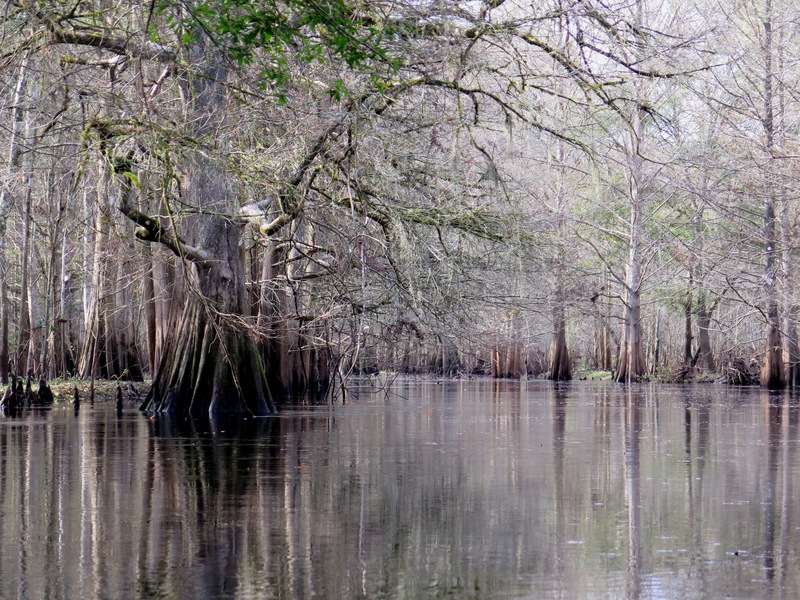 Tall cypress, turned brown and draped in moss shrouds and air plants, framed the waterway. 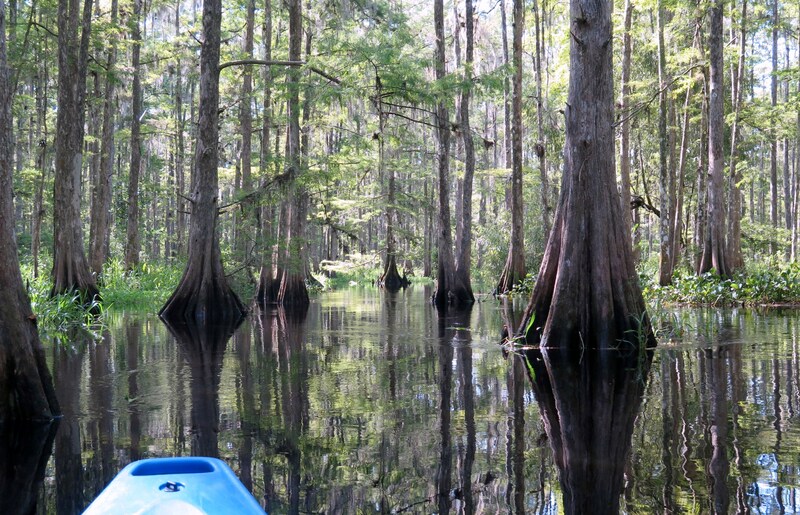 Twenty minutes into my paddle, I entered the cypress swamp—my favorite part—and paddled among the cypress trees, twisting left, then right, the landscape deserving the front cover of a nature magazine. Paddling this creek for the third time, I have discovered that it’s pretty darn important to watch for the small kayak signs to stay on the trail. More than once I had to turn around and find the trail again. The other paddlers had gone ahead, so I was alone in the swamp, enjoying the sweet melody of bird sounds—such as the honking of the ibis and croaking of the great blue herons. (I know, melodious, right?) I paddled past wood storks—happy to see them amongst the others, and lots of vultures, egrets, anhinga and cormorants. Gators sun bathed on the shore, not bothered when I paused to take a picture–while others bobbed in the water as I floated by. I spotted more gators than ever—perhaps due to the low water level forcing them closer to the trail. At times, I had to choose my path—to the left or right—based on gator sightings. About three hours into my paddle, I spotted a patch of sand on the side of the creek and pulled up for a quick stretch before paddling the last hour on this beautiful waterway. (Sigh) What a great way to begin the New Year! 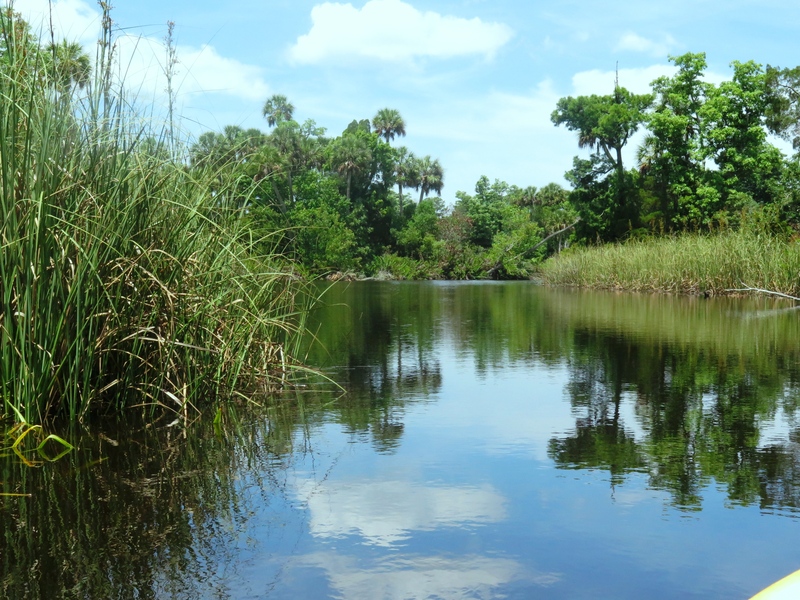 headwaters of Spring Garden Creek in Volusia County–which flows for four miles from the springs to Lake Woodruff and another six miles to the St. John’s River. We intended only a short paddle this day–an out and back, about two hours. 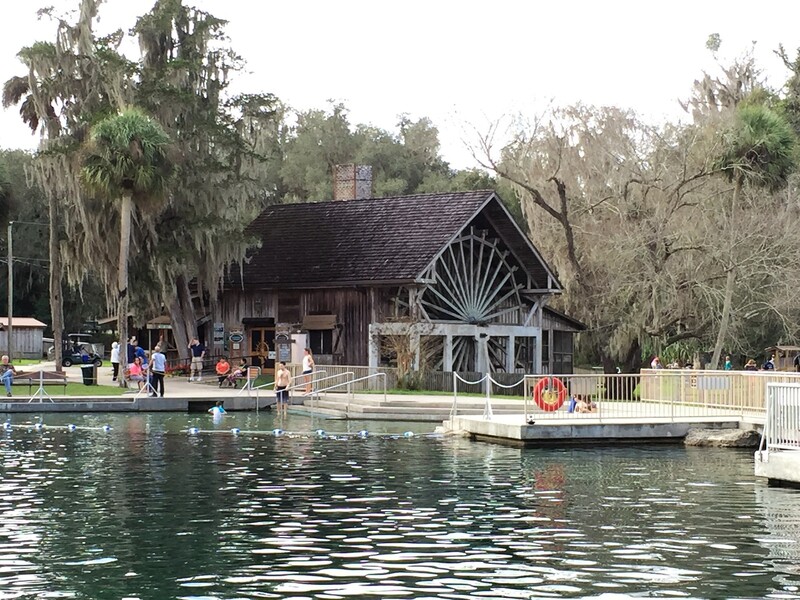 We rented kayaks at the onsite concession in the park, walked past the beautiful live oaks and the many sunbathers along the banks of the springs, hopped aboard our vessels, and paddled away. Missy spotted a manatee immediately and paddled along side if for a bit. Then, we headed down Spring Garden Creek towards Lake Woodruff. We had yet to have winter weather here in Florida, so it was a pleasant day–if not a little warm on the wide waterway. We kept to the shore, trying to catch a little shade. The waterway was quiet–with the exception of an occasional boat. No surprise that we spotted many birds along the shore–herons (great, blue, tri), egrets, ibis, coots, cormorants, anhingas, and osprey, as the park is on the Great Florida Wildlife and Birding Trail. We never did make it to the lake, but we enjoyed the paddle and our brief encounter with nature. 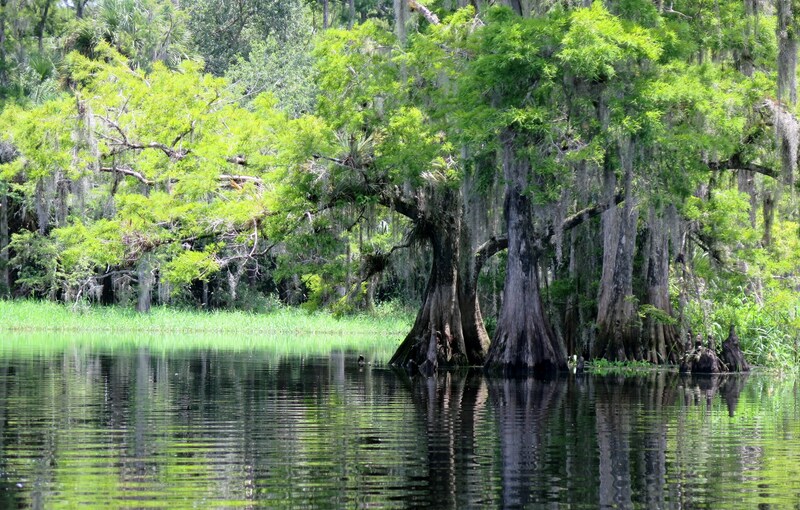 me, the river was wide and bordered with beautiful cypress, oak, maple, tupelo and pine trees…an “Old Florida” postcard. 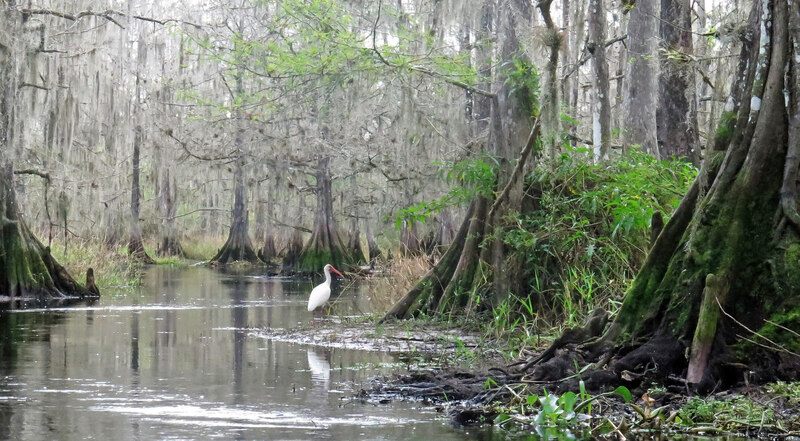 The Wacissa River begins close to where I put in—in the swamp with a couple small springs. However, the larger Big Blue Spring is considered the headwaters of the river. 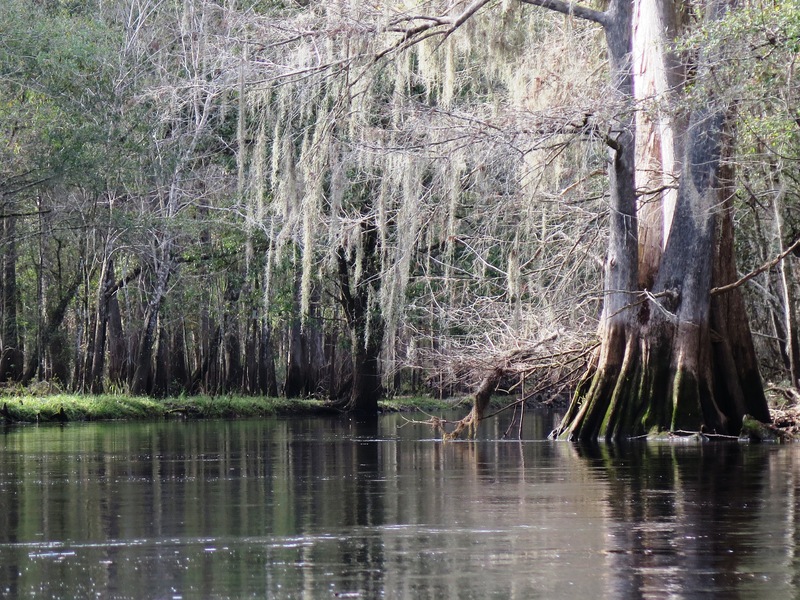 The river runs about 14 miles and ends as it flows into the Aucilla River by way of a man-made canal. 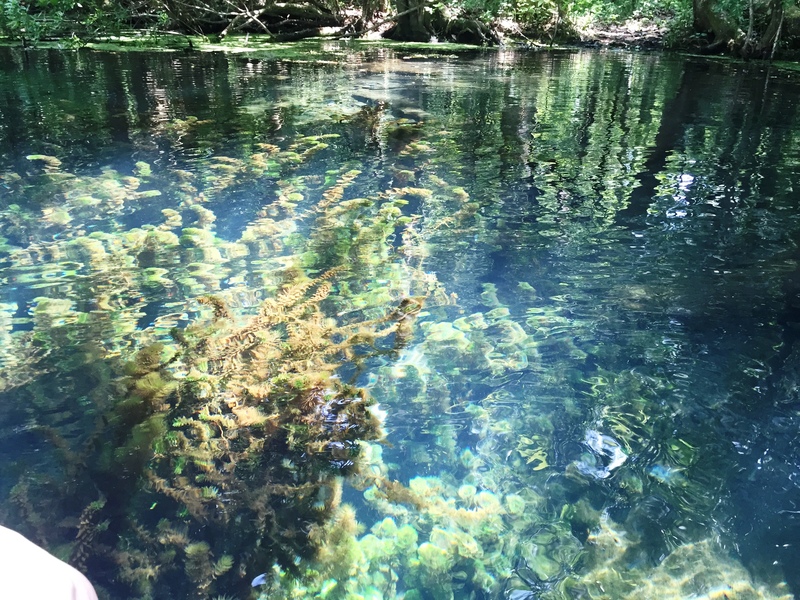 About a dozen springs add to the flow of the Wacissa (Carter et al.). I paddled south, towards Big Blue. An orchard of water plants, such as Pickerel weed, forced me to the middle of the river, away from the shade of the banks. The thought crossed my mind more than once that I should have saved this river for cooler weather! The water deepened, and below me, invasive hydrilla—like thick masses of dreadlocks—blocked much of the view of the sandy bottom. As much as the water plants kept me from shade, they were also alive with sounds of screeching and squawking birds. I saw blue heron, common moorhen, and egrets. I paddled past the frolickers at the Wacissa County Park—splashing around, trying to keep cool on this very hot day. A couple young boys in a canoe had hooked a small gator—and neither the boys nor the gator seemed to want to give up the lure. I arrived at Big Blue Spring, delighted to find shade at last. I paddled over the Spring and peered into the clear water—beautiful shades of blue and green. However, the hydrilla growing in and around the Spring kept me from dipping. The ickiness of it all did not tempt me! On my paddle back to the outfitter, I discovered that the river had many little nooks and crannies to explore which gave me a break from the sun. It really was a lovely river. 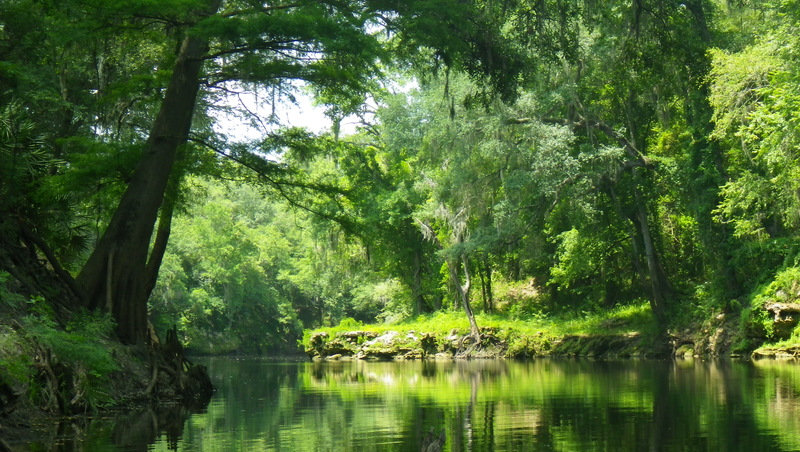 Sunday morning, I headed to Withlacoochee River North, renting a kayak from Lucas at the Suwannee River Canoe Rental. Lucas dropped me at Blue Spring about 10:30 a.m.—not nearly early enough to beat the many families already splashing around in the clear cool water. Where else would one go on such a hot day? It was in the 90s, but it would feel in the 100s by mid-afternoon. 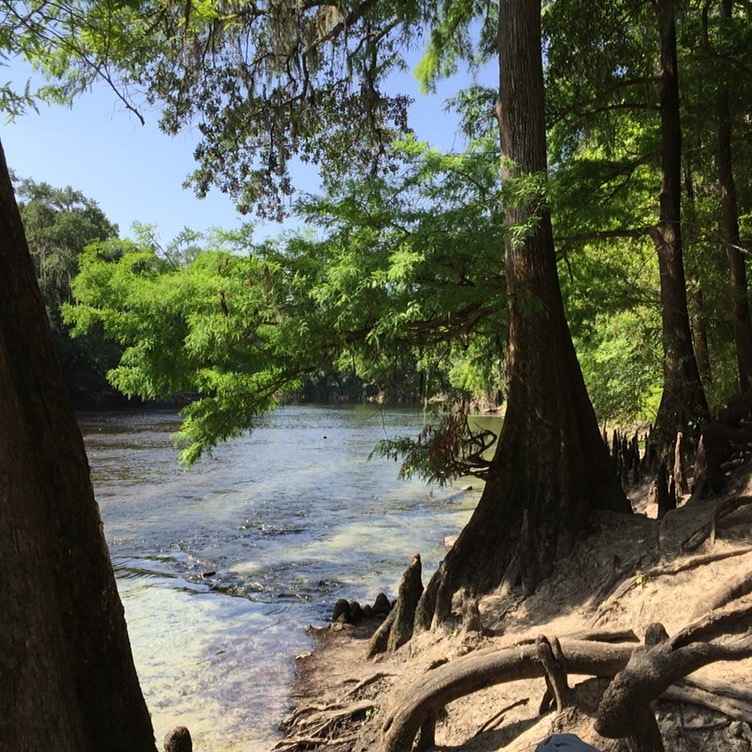 Lucas would pick me up at the Suwannee River State Park—a 12-mile paddle from here (longer than usual for me!). It would take me about 6 hours—did I mention how hot it was? There are two Withlacoochee Rivers in Florida. 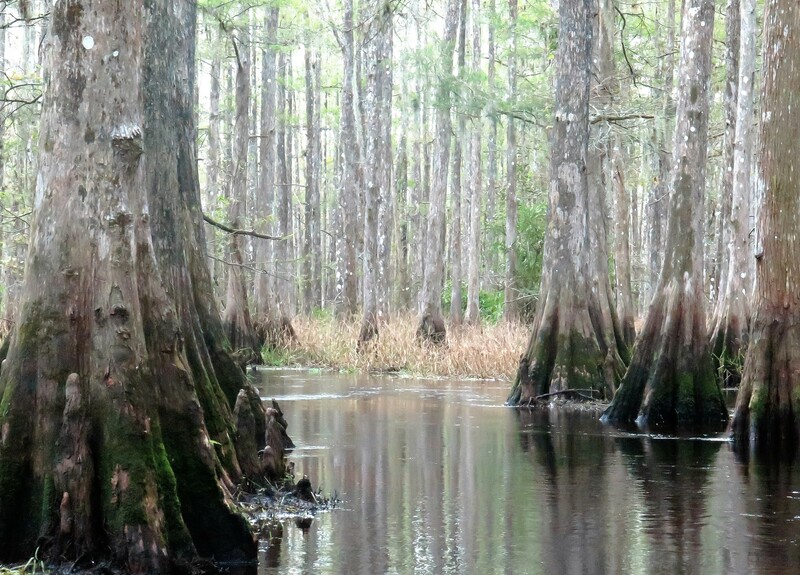 I have paddled the Withlacoochee River South—which originates in the Green Swamp—twice. I loved it. The Withlacoochee River North originates in Georgia. Its black waters flow about 70 miles in Georgia and then another 32 miles in Florida before the river finally flows into the Suwannee River. I would be paddling the final 12 miles of the river. Lucas had told me that given the choice, most people chose the Suwannee over the Withlacoochee. 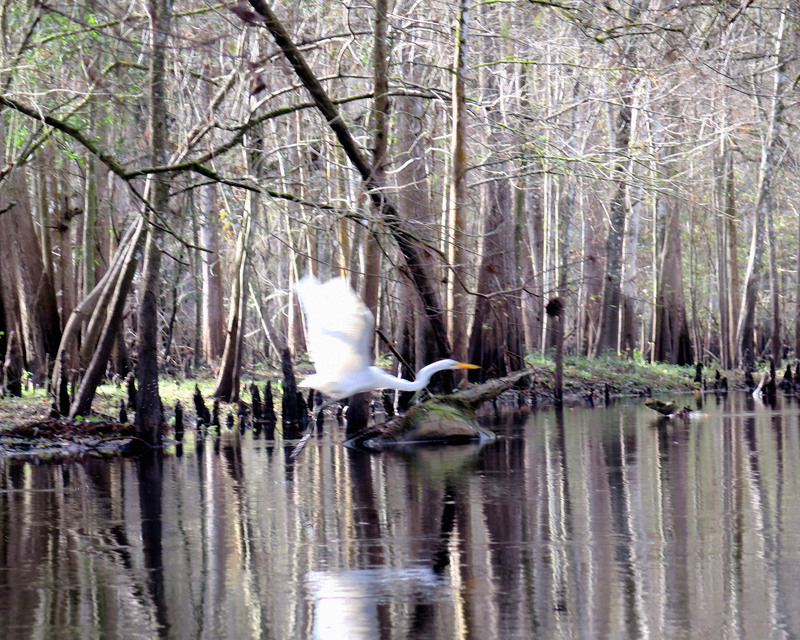 He explained that the Suwannee has higher limestone banks and more sandy beaches for paddling picnics. I paddled the Suwannee a few years ago, and although beautiful, I had been surprised at the amount of trash along the river. The price of being popular, I suppose. I paddled south and took in the “Withs” limestone banks, etched out by the movement of the water over the years which created beautiful designs and little caverns. The surrounding green forest of cypress, oak, maple and tupelo trees shaded the edges of the river, giving me a little break from the hot sun. Moss hung from the trees as if stretching to reach the river. Dark green ferns poured down the banks. This picturesque scene only needed a plantation to complete it. What a beautiful river! Large fish jumped around me as I paddled. I laughed, thinking one would land in my kayak. Herons, hawks, turkey vultures, ducks and turtles braved the heat. I passed only an occasional paddler or flat-bottom boater along the way. I stopped by other springs, smaller than Blue: Pott, Tanner, and Suwanacoochee. I heard the shoals before I saw them. Seriously, I thought I was approaching a sizeable water fall! But alas, most of the shoals were quite harmless. The final two shoals were much more fun, and the last one included a little white water as well! The small soaking I received helped to cool me down. Just after the last shoal, I spotted a deer on the west bank that had come to the river for a sip of cool, spring water. 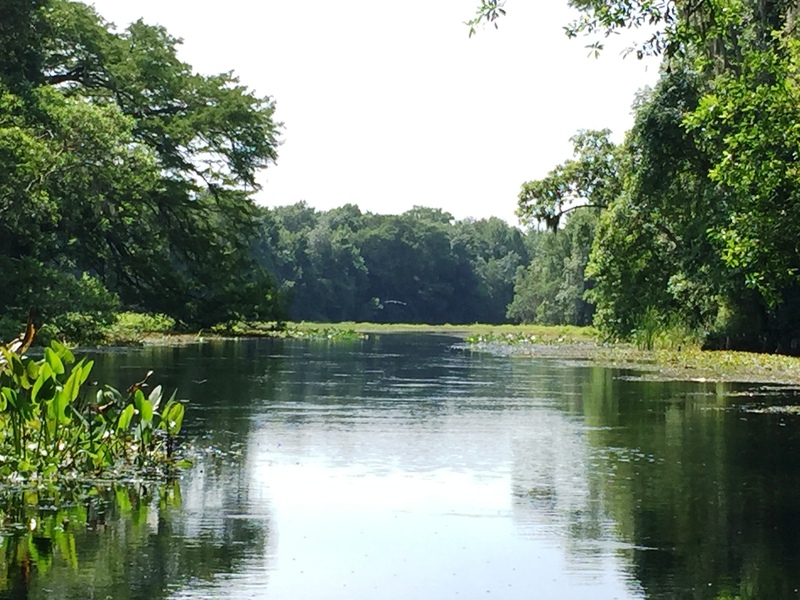 As much as I loved paddling the Withlacoochee, after six and a half hours, I was happy to see the Suwannee River. Lucas was already there waiting for me. river—one which I had previously paddled. Coincidentally, I had paddled this river for the first time two years ago on the same day—December 28. I love, love, love this river; this is a “must paddle” river for anyone who enjoys nature, peaceful serenity, and paddling. Park, dropped me as close as she could to the river’s source, the Lacoochee Park put-in, I had wanted to be closer. This time, with the water level higher, a “big water,” she dropped me deeper into the forest, at the High Bluff put in—closer to the river’s source but still about a two-hour paddle away. From High Bluff, I expected at least a 3-hour paddle back to the RV Park, so I decided not to paddle deeper into the swamp before heading west and back to the outfitter. On the drive to High Bluff, Jacqui pointed out the site where the Cummer Sons Cypress Company sawmill once stood. The Cummer brothers built the mill in 1922, and for nearly four decades until the mill closed in 1959, Lacoochee prospered and grew (East Pasco Historical Society) —at the expense of the cypress, of course. So, I paddled away from the High Bluff put-in. I wore an orange vest as I did two years earlier; it was hunting season (hogs and deer). It felt like winter on the river. Tall cypress, now bare except for moss that hung like tinsel on last year’s Christmas trees, surrounded me. I felt grateful that the Cummer brothers had left some cypress for me to enjoy. What a beautiful river! still. 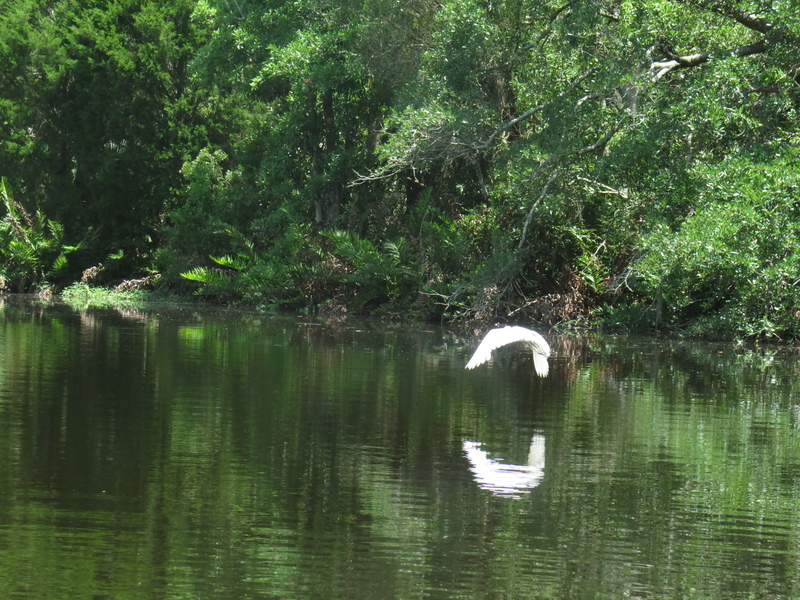 High waters had forced the wading birds (cormorants, egrets, and ibis) deeper into the woods, and the river remained quiet with the exception of the occasional splash of a gator’s belly flop. The river was awesome, and I was awestruck. Old wood-framed houses began to pop up as I neared the outfitter—way earlier than I expected. I arrived at the outfitters in less than two hours from my put-in.